Bottle Tops...Finally! 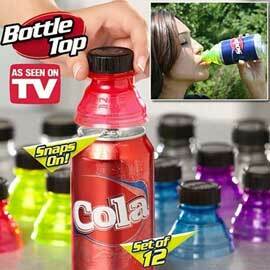 A plastic re-closable top designed to snap onto virtually all 12 and 16 ounce aluminum beverage cans. It effectively converts the ordinary, messy can into an easily portable, re-closable, non-spilling, identifiable bottle. More benefits of Bottle Tops include preventing bugs and bees from getting into your can, and keeping the fizz from getting out! Bottle Tops will keep your drinks fresh for days! When your can is empty simply Snap the Cap onto a new beverage and youre ready to go! Bottle Tops are re-usable, and come in an assortment of colors for personal can identity, so youll never mistake your drink for someone elses again! Today, as part of this special internet offer, you will receive a set of six amazing Bottle Tops™ for only $10 plus $6.99 shipping and handling. And as a BONUS, you’ll also get another set of six Bottle Tops™, just pay separate $6.99 S&H. Now you’ll enjoy all the benefits of a re-sealable bottle top with your favorite canned drink. That’s a tremendous value. This special offer is not available in stores so order online today! We don't always like to drink a whole can of pop at a time. If you put a Snap Capp on the can and then put it back into the fridge, your pop doesn't lose its FIZZ! These are great for kids who only drink a few swallows and then abandon the can. If it tips over in the fridge, it won't spill all over. We are buying them for friends and family. They make great stocking stuffers or just cute gifts.